The Official Handbook Book of the Dead will give Red Guardian's full name as Alexi Shostakov. Natasha was trained as one of the Black Widow squad in WWII before she met Alexi, as confirmed in the BW: Deadly Origin limited series. But she also had conflicting memory implants, one of which could correspond to her story here. That series also says she was given a serum to keep her young, possibly a variation of the Infinity Formula that Nick Fury had. Red Guardian was meant to be really dead this issue, and he will turn up a Legion of the Unliving in #353-354. Unfortunately he will also turn up alive as an old man in a new identity when he tries to orchestrate revenge against still-young Natasha in Daredevil(1998)#61-64. Meanwhile the Russian State will create more versions of the Red Guardian, including an android who pretends to be Alexi in the BW graphic novel The Coldest War. In Namor Annual #1 and Captain America Annual #13 we will also meet a WWII Red Guardian. But the longest running version won't be a tool of the State, Dr Tania Belinskya debuting in Defenders #35. The next Avengers issue is their 1st Annual. But before that according to the Official Index Cap will pop over to Strange Tales #159-162 to spar with Nick Fury and discuss an old unclosed case involving the Yellow Claw, and then rescue Sharon Carter from AIM in his own strip in Tales of Suspense #92-94. The Avengers, including Hawkeye, appear in ToS#92 as Cap reports in saying he's just returned from some SHIELD work. This can tie in with ST#159-162, but the Avengers say he last saw them with Diablo in #42. This is a typical problem with trying to create a single timeline for all Marvel comics, especially the split-book series like ST and ToS where a story can last many issues and often there is supposedly no gap even between stories. But Widow survives the Psychotron (due to her SHIELD post-hypnotic suggestion) and escapes to try and destroy the device, thinking to herself that this was the 2nd part of the plan. Even when her first attempt fails the post-hypnotic suggestion enables her to gain the Communists' trust via the lie-detector, which allows her to try again. There are at least 3 holes in this story. In #39 Nick Fury claims they don't know what it is they've sent Widow to find, which means it's pure luck her post-hypnotic suggestion works against the Psychotron. And the experimental plane she stole presumably wasn't something it was OK to let the Chinese have. But the biggest problem is that it relies on the baddies taking Natasha to the secret weapon. (Actually this kind of thing happens a lot in comics villains' masterplans, and in many spy and thriller novels. One side does A and then the other side does B. Later we learn that A was done to cause the other side to do B. But not-so-careful thought will reveal that B was far from the only possible response, and often not even a logical one, as here.) In fact, as it happens they only took her to the Psychotron because she had been betrayed, which wasn't part of the plan. I'm also not sure that Roy Thomas didn't get confused by his own plot this issue. The Avengers follow a suspicious homing beacon into a trap. Did Gen'l Brushov arrange that in order to pit Red Guardian against Captain America? But he couldn't have been the author of Hawkeye's message last issue telling the Avengers where he and Hercules had gone. Or did Natasha set the beacon (but not the trap)? As Hawkeye thinks she arranged for his tube to fail. Now that we've reached the end of Black Widow's mission begun in #38 I'll try to make sense of SHIELD's plan. SHIELD knew that the Chinese had developed a secret weapon, but they didn't know what it was or where. They want Widow to find out. She steals plans of an atomic sub (which are obsolete) to use as evidence that she is still loyal to the Communists, and then steals an experimental plane (which presumably isn't obsolete) to get them to China. A SHIELD defector then tells the Chinese that the plans are obsolete and Natasha is a SHIELD agent. This prompts the Chinese to take her to the Psychotron and throw her in. Thus helping her attain her goal. Hawkeye and Black Widow are imprisoned in a secret Chinese base where Natasha had been sent by SHIELD to destroy a new weapon called the Psychotron. Inside the Psychotron Hercules thinks he is fighting the Hydra. The other Avengers are on their way from America. The Red Guardian, the Communist answer to Captain America, has revealed himself to be Natasha's supposed-dead husband. Russian General Brushov wants Red Guardian to prove Communist superiority by defeating Captain America. But Chinese Col. Ling is convinced his Psychotron is more important, once they expand its range so that it can sow fear across the US. However he will need Russian atomic submarines to get Psychotrons near America. The Avengers arrive, following a suspicious homing beacon. 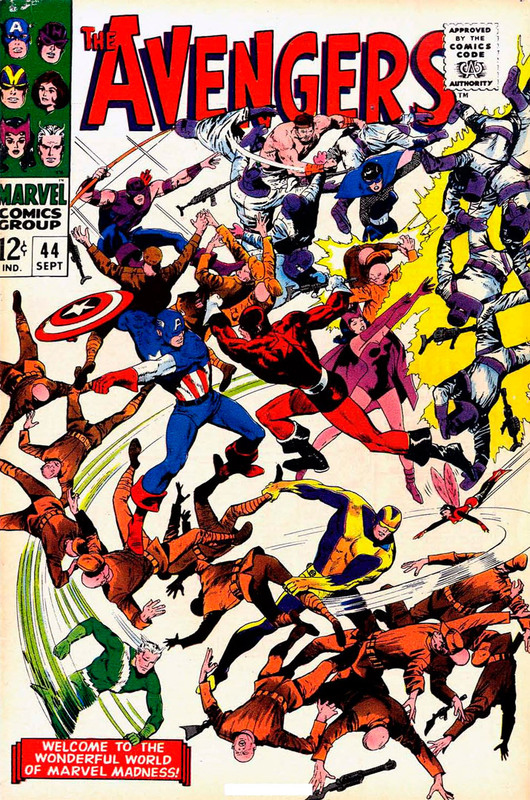 They battle the defending forces until Cap is knocked down a shaft into one of the transparent tubes Hawkeye and Natasha found themselves in last issue. Cap breaks out and Brushov gets the fight he wanted as Cap and Red Guardian duke it out. The battle is inconclusive until Cap's shield and Guardian's 'hockey puck' meet in midair. The puck shatters, but the shield doesn't return to Cap. Cap KO's Red Guardian, but is himself shocked with electricity by Ling as he tries to retrieve the shield. Meanwhile Hawkeye's restraining tube had suddenly shattered, and he rushed off to find the Widow, whom he suspected must have caused it. She had taken the opportunity while everyone was watching the fight to sabotage the Psychotron. Ling notices and tries to shoot her, but the revived Red Guardian takes the shot for his ex-wife. Hawkeye arrives in time to catch her as she is hit by another shot. The whole place catches fire, but Hercules breaks out of the now-inactive Psychotron and smashes a way free for them, with Hawkeye carrying the wounded Widow and Hercules hefting the unconscious Cap. Ling makes one last attempt to shoot Cap with a laser beam, but he is stopped by the wounded Red Guardian, who has had a last minute conversion to the light. He doesn't want a valiant opponent shot while defenceless, and also fears for his ex-wife. The laser beam goes wild, and the base goes up in explosions. The other 4 Avengers have abandoned their attempt to fight their way into the base and have been flying round in the aero-car. So they are on hand to pick up the 4 escapees, and they all return to America. Natasha is rushed to hospital and saved from her wound. When she has recovered, Natasha explains various things. Her husband Alexi was a test pilot, and she was told he had died in an experimental rocket. She now realises he had been taken to be trained as the Red Guardian. But at the time she had become Black Widow in his honour. Cap tells her he died saving them. For this mission SHIELD had given Widow a post-hypnotic suggestion to believe she was on the Communists' side whenever her loyalty was tested. This enabled her to survive the Psychotron and fool the lie-detector.